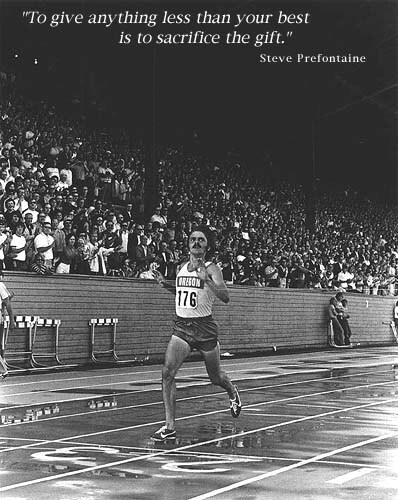 Steve Prefontaine - "The Gift"
If a single image can capture an era, Jeff Johnson's photograph of Steve Prefontaine winning at Hayward Field exemplifies the days of Pre, "his people" and a world that will not be seen again. Pre has his eyes on the clock as he breaks the tape. A packed house is on their feet, witness to another victory by possibly the greatest American distance runner. Jeff Johnson's photograph provides us with a front row seat - an insider's view to history. 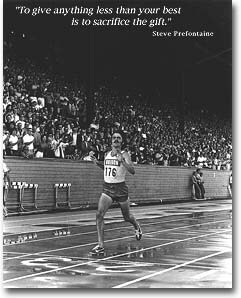 Jeff Johnson was a photographer for Track & Field News from 1967 to 1985. His images have appeared in many books and publications. His vision and dedication enhance the story of track & field. National Distance Running Hall of Fame's permanent collection. Pre was inducted into the Hall on July 8, 2000. The Pre poster came in and it's UNBELIEVABLE!!!!! "I was very impressed with the care used when shipping my poster and I thank you for that. I love the poster and it is already on the wall..."
"I loved it! I've seen that quote before at his museum; very inspirational. You guys did a wonderful job...very classy." "That is a great poster. Some guys on my floor are now going to order it..."
Photos may not be reproduced without his permission.